So yesterday and today were quite hectic. Yesterday afternoon, I met an old friend for lunch. She was my senior in University and we were meeting after many years so it was good to catch up. We had some very nice Italian food and as it was a lovely and warm day went walking via the Museuminsel, an island in the Spree river that houses world famous museums like Pergamon and Bode, to Hackescher Markt and Alexanderplatz areas of Berlin which are these really nice open squares. 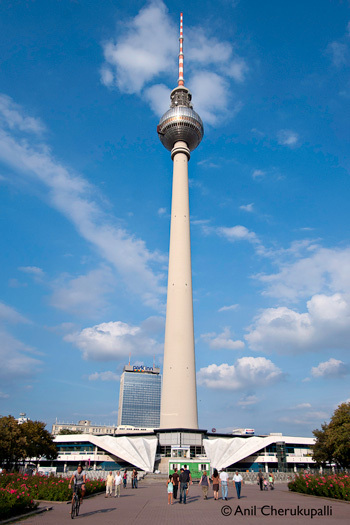 Alexanderplatz, formerly part of East Berlin, also has the really huge fernsehturm or TV tower that is iconic for Berlin. In the evening I then went to meet my co ATSA fellow Rashmi Dhanwani, who is doing her secondment at the 11th International Literature Festival that is currently taking place in Berlin. We attended a few sessions, one on the limits of freedom of speech which had Fleming Rose, the person responsible for publication of the Danish Cartoons that created such a furore sometime back, another session on the 10th anniversary of 9/11 and the best session of all, an interesting discussion with Pankaj Mishra on how Indian society is dealing with increasing modernity. Later, we went and had a couple of drinks in the writer’s tent and engaged in some nice conversation with some very interesting Indian, Bangladeshi, Hungarian and New Zealander writers and poets including Altaf Tyrewala and Peter Zilahy who were so nice to talk to! So all in all a productive day. Today my secondment started. As part of the secondment, which I’m doing with Loupe, I’ll be looking in on the post production of a film they have made from tomorrow onwards. I’ll also accompany them on a film shoot if possible. And whenever I find time I’ll be doing some background research for one of their upcoming films. Through Antonia, who started and manages Loupe, I met today Anne Schönharting, one of the photographers who is managed by a well known photo agency called Ostkreuz, which was started by a group of 7 former East German photographers. I’ll also accompany Anne on a portrait shoot one of these days. Through her I will meet the founders of the agency and talk about my project Aksgar with them. There is also a plan for me to do a short presentation on Aksgar to students of a photography school one of the partners from Ostkreuz runs, which should be quite interesting! Then I’ll also be meeting the editor and a few other people behind a print photo magazine which publishes stories based on the six degrees of separation principle and has won some awards for the photography work it featured. So this is how I’m set up for the next couple of weeks! On Saturday, I went to the Potsdamer Platz, perhaps my favoritest spot in Berlin. Before WWII, this was the main social center of Berlin with the then elite concentrating at the famous and opulent Hotel Esplanade. The whole square and the buildings were almost completely destroyed in the allied bombing of 1944/45 during WWII. After WWII, it became a huge empty piece of real estate and sadder still during the height of the Cold War it became a no man’s land due to the building of the Berlin Wall by East Germany. However, with the fall of the Wall in 1989, the area enjoyed a new lease of life with lots of new construction planned around the square to bring it back to its former glory and also showcase it as the way cities would be in the future with plans for unique living, cultural, entertainment, eating and business spaces. That construction is almost complete now and Potsdamer Platz is now a vibrant area with a cluster of very interesting places in and around it. 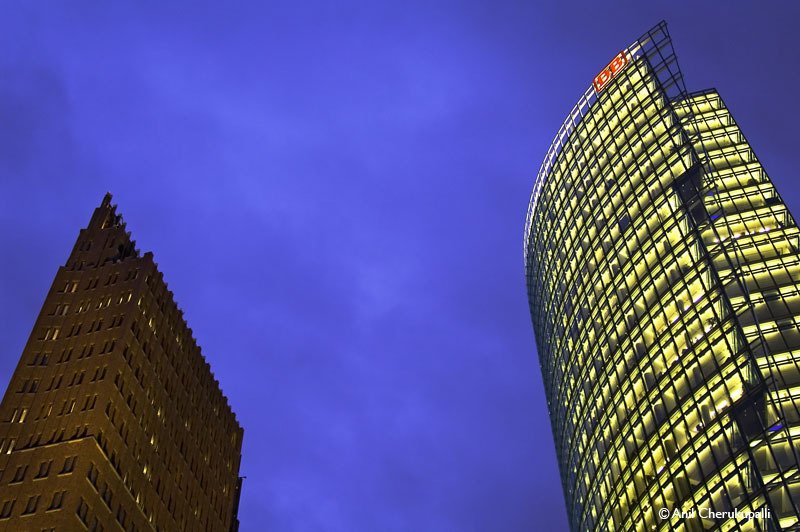 The huge Sony Center with its distinctive umbrella like conical roof is here, the Berlin Philarmonie is next door as are the world class museums like Gemaldie Gallery and the New National Museum for Modern Art. 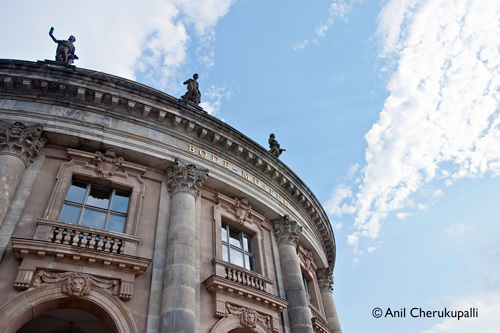 The Berlinale and other major events are also centered here. While I’m not a major fan of the predominantly glass fronted buildings that line the square, the square has a certain dynamism with clean open spaces opening up to the horizon that somehow appeals to me. 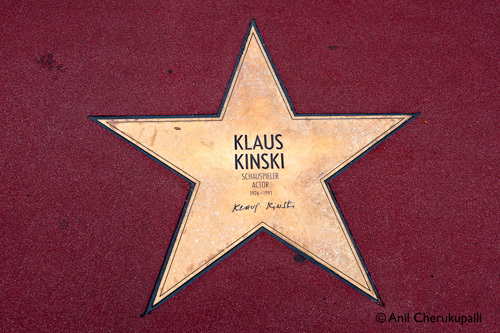 There is also a replica of sorts of the Los Angeles’s famous Hollywood Walk of Fame that here pays homage to the famous members of the German film fraternity. It was nice to come across, among others, the star of iconic German actor Klaus Kinski, whose longstanding collaboration with equally well known German director Werner Herzog resulted in some landmarks films in world cinema.